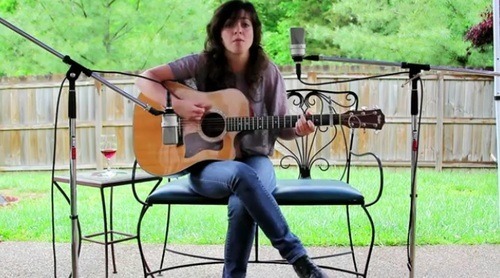 Last weekend, Singer/Songwriter Julia Sinclair joined me as a guest reviewer for Ma’amCakes! A fellow (Upstate) New Yorker, Julia has been playing the guitar since she was seven years old, and to this day can play the classical, electric, and acoustic guitar, as well as the bass, mandolin, cello, piano, and more! 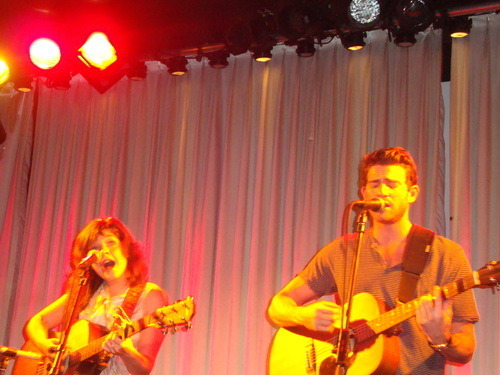 Julia has played at SXSW, and completed a national tour with Mat Kearney and Ingrid Michaelson, as well as an east coast tour with Bryan Greenberg last year. Currently signed with Red Light Management, and living in Nashville, Tennessee, Julia is here in Los Angeles for the summer to finish up her debut album. 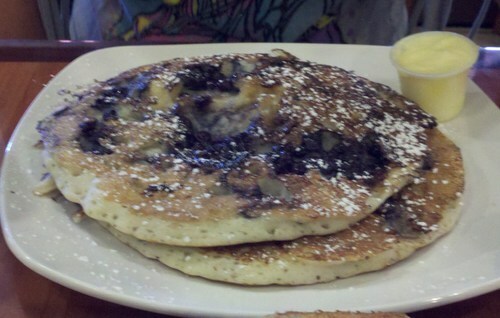 For her Ma’amCakes debut, Julia picked Jumpin’ Java located on Ventura Boulevard in Studio City, CA. 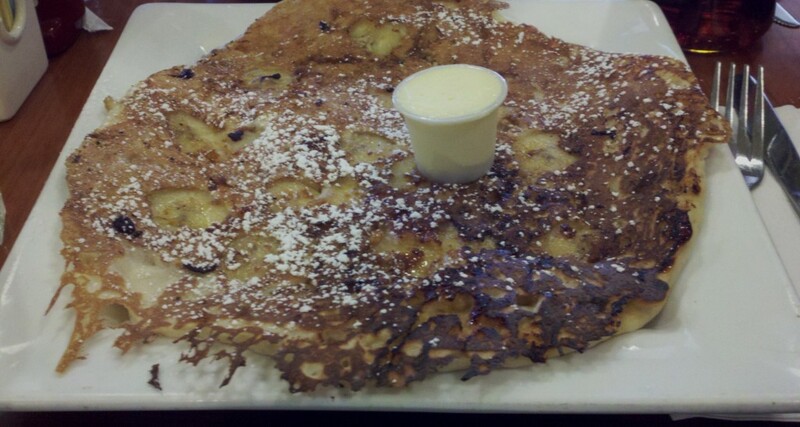 After finally deciding on the Banana Nut Pancake… well, I didn’t expect it to look like a potato latke, that’s for sure! (Yes, I am hyper-linking. For all the non-Jews.). But boy, did it taste like anything but! 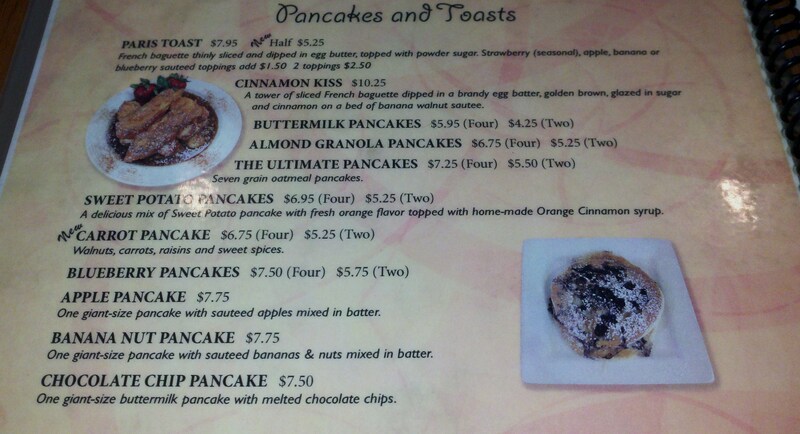 One thing to note about Jumpin’ Java is that they actually have quite a crepe-selection. As a result, the Banana Nut Pancake tasted like the perfect combination of a crepe and a pancake. Now personally, I am not the biggest fan of crepes (check out my Talladega Nights posting), and unlike popular belief, pancakes and crepes really are two separate treats. That being said, I did enjoy this combination from Jumpin’ Java. The pancake had just enough crispiness, fruit-freshness, fluffiness, and texture. Kudos to Jumpin’ Java for putting such a unique spin on the Banana Nut Pancake breakfast. “This looks so good,” said Julia, “I like that they give you a lot of butter – some places are stingy with that.” Julia enjoyed her syrup-less pancake as she stated “Yeah these are awesome, and I don’t need syrup.” Well, they’re good in my book then! As Julia was describing her love for the Blueberry Pancakes, she said “These have the perfect amount of cakiness, as they aren’t sticking to the roof of my mouth.” Julia also agreed about the way the pancakes were cooked as she said, “They combined the crispy and fluffy very well. I’m impressed.” You’re right, Julia. I too am impressed. Overall, the Ma’amCakes at Jumpin’ Java were excellent because you could taste the hard work and care put into the batter. The best part about Jumpin Java (besides the pancakes) is they serve breakfast ALL day and ALL week, AND some of the pancake dishes give you the option of two vs. four pancakes. It’s as if Jumpin’ Java has been following Ma’amCakes’ reviews, and placed one suggestion per review within their menu! Jumpin’ Java has officially been added to my list of favorites. 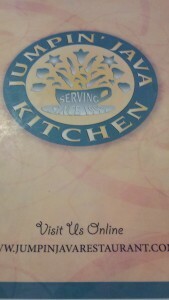 Thanks so much, Julia, for being a part of Sunday brunch with Ma’amCakes! 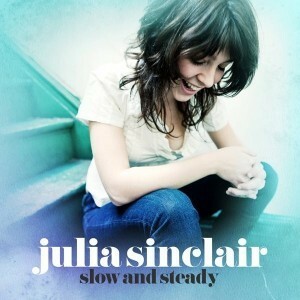 Be sure to check out Julia’s EP Slow and Steady now on iTunes, her You Tube channel Julia Sinclair Music, and look out for her debut album this winter.